Doubles its Network to 6000th mark in last 5 years from 2700 outlets in FY’14. Mohali, 29th March, 2019: Moving a step closer to its customers, Honda Motorcycle & Scooter India Pvt. 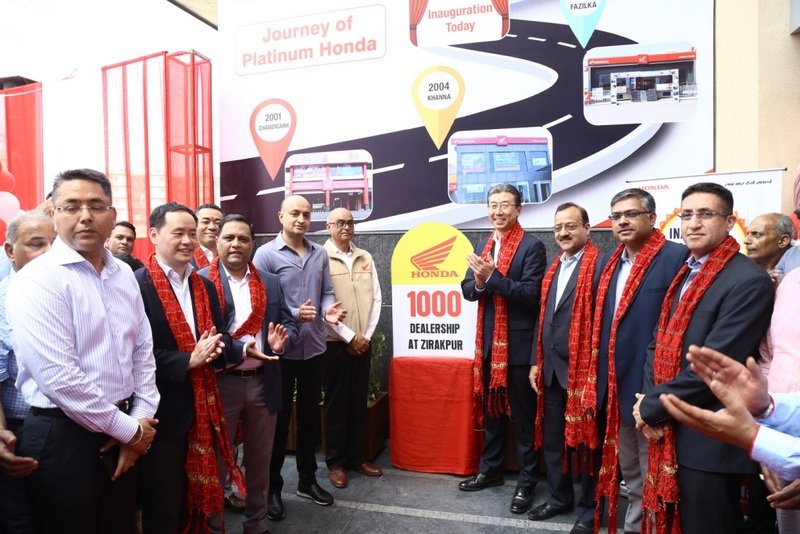 Ltd. (HMSI); with its aggressive network expansion plans, announced the opening of its 1000th HEAD (Honda Exclusive Authorized Dealer) with the inauguration of its new 4S (Sales/ Service/ Spares/ Safety) facility at Platinum Honda, Zirakpur (District Mohali), Punjab. Honda continues to spread its wings in India and provide customers with last mile connectivity. Since the start of its operations, Honda has exponentially enhanced its production capacity and introduced new products across categories. While manufacturing the best quality products with cutting edge technology, the company continues to strengthen its network. All Honda Authorized Exclusive Dealerships (HEADs) offer a 4S setup including the industry norm of Sales, Service, Spare Parts and the 4th ‘S’ unique to Honda which is Safety Riding Promotion. The skilled staff trained by Honda offer unparalleled experience of best quality sales and after-Sales ownership to all our valued customers.